In late August 1974 I arrived on the campus of Indiana University, in lovely little Bloomington, Indiana. I knew a few people there, close friends from Indianapolis, but I was ready to expand my horizons. Time to find something to join. But first the duty of every student: register for classes. Registration took place in a big athletic hall. All students were assigned a time for entry based on their seniority and surname. As a freshmen named White I was among the very last. When I arrived, the waiting line snaked out the door and wrapped around the lawn in front of the big red-and-white building. VERY slowly the queue progressed toward the door. Thank goodness there was something entertaining to watch while we waited. A little troupe of clowns were goofing around, presenting a bit of street theater about registration. They were handing out Monopoly money to the students on line, spieling off schtick about student loans. “Hey Leon,” somebody yelled, “got some for me?” “Lots,” yelled back the ringleader, a chunky, swarthy fellow in a red I.U. band jacket and bright red high-top sneakers. A little red wagon at his side overflowed with piles of the play money and more red band jackets. I don’t know what came over me, but I broke from my place in line, grabbed up some handfuls of phony cash, and handed them to the fellow who had yelled at Leon. Then I did more of the same, shrugging on one of the red band jackets, blending in with the other half dozen boys and girls goofing around with Leon. I didn’t know it yet, but this was Leon Varjian, campus clown and math T.A. Since 1970 he’d been a legend at I.U. for promulgating a parody of student activism, a leavening agent against the waves of unrest that washed back and forth across that campus. By the time I arrived in 1974 the student protests were a thing of the past, but Leon was still in full swing with his goofy schtick. They looked like campus radicals, but had no serious political purpose. This was about reminding students to have FUN, after those hard years of trying to stop the war and change the world. I don’t remember transitioning back that day, from volunteer clown to freshman registering for classes. I do remember joining Leon and his friends later in the campus snack shop, where at some point he turned to me and said, “So who ARE you?” He’d just assumed I was a friend of one of his gang, and when no one turned out to know me, he was surprised and, I think, I little impressed. I didn’t have a clue who I was, myself. I just gave him my name. Shortly following registration, the student union offered an Activities Fair, with all kinds of student groups on display, eager for joiners. I could’ve found any sort of interest to pursue there, but what did I do? Work Leon’s booth where he was recruiting for the SLA, complete with a Patty Hearst look-alike on display bound to a chair, reciting “I love the SLA! I LOVE THE SLA!” at mock gun-point. After that I joined Leon’s little band of clowns once or twice a week for “actions”. Every Wednesday at noon, he’d present some kind of public fun in front of Ballantine Hall, the hulking 10-story undergrad classroom building. He’d arrive with his red wagon filled with props and we would find him there, get our orders and proceed with the goof. It might be launching flights of paper airplanes from the top stories. It might be a ping-pong ball regatta on the little creek in front of the building. It might be rubber band assaults, or free paper hats of folded newspaper for all comers. You just never knew. But there he’d be, ringing an old school bell and making some crazy pronouncement: President Nixon had resigned because of an ingrown toenail, or IU was to become an amusement park. 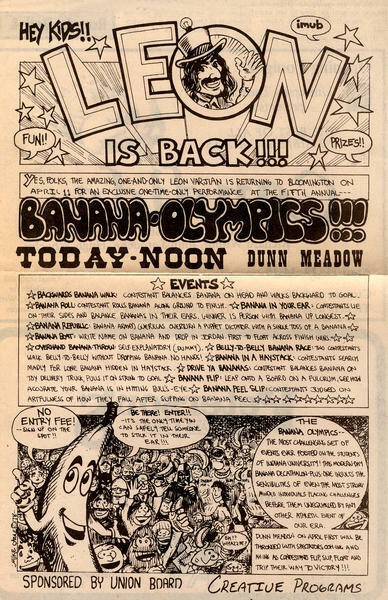 That fall Leon ran for student body vice president on the Birthday Party slate. His girlfriend ran on the “Garden Party” ticket. There was lots to do. I went to planning sessions at his little apartment with the Murphy bed. The amount of paraphernalia, props, trash, he housed there was truly amazing. Grocery carts full. I seldom said anything at those gatherings, as I recall. In me were a clown and a shy girl, and I had little control over which would appear. Quiet girls who admire the guys are welcome in that sort of group, and I felt liked by all. My birthday came in early October. Leon presented me with my own red I.U. band jacket—he had purchased 50 of them at an auction at some point. He tucked a Donald Duck Pez dispenser in its pocket. I wore that jacket everywhere that fall. Halloween came, and Leon announced a costume parade. I made my only visit to the campus library, to research just what the Statue of Liberty’s crown looks like. I manufactured a lovely costume for myself, granny dress draped in a flag and wearing a hat of rays covered in tin foil, holding a foil-wrapped flashlight. At twilight we paraded through campus. After the crowd broke up, I spent the evening playing living statue on a pedestal outside the student union, holding my flashlight-torch aloft and observing the revelers flowing past my feet. I remember very little of that semester after Halloween. It all caught up with me—the stimulation, the effort to keep self fed, clothed, and showing up for work and class on time. What I do recall is that I took a class entitled “Survey of Eastern Religions.” Each six weeks we studied a new religion—Bhuddist, Hindu, you name it—and I converted to it. By November we were learning the Hindu principle of “neti neti” which means, “not that, not that.” By voluntary withdrawal from action one becomes closer to God. But I became closer to dropping out of school, and indeed, neglected to register for classes or for my dorm room the following semester. Somehow it came as a surprise to me when the semester ended and the RA came to tell me I had to leave, I was no longer an I.U. student. All the things I could’ve joined, and I chose the dada activist from New Jersey, until the path of neti-neti caught up with me. By Christmas I was home in my old bedroom, surrounded by suitcases I refused to unpack. What a great piece. I think it says so much about “who we are” during those growing years of college. Trying to find an identity, or maybe being saddled with one we are to wary to let go. And maybe it’s not who we are, but who we become. On another tangent, I’ve so enjoyed Leon hijinks here in this neck of the woods over the years. He made the UW seem like fun. I’ll never forget our own Statue of Liberty on Lake Mendota. Wonder if you were the inspiration for that, Sarah! I read this piece to a Freshman class in “Reading and Writing Memoir” at Edgewood College this week, and felt like such a Holy Fool…I hope they got the message & choose their actions with a bit more thought to their repercussions than I did! Thanks, Brian, for the insight–I’d never connected my memory of Leon/Statue of Liberty with his famous Lake Mendota installation. Proud to think I might have played a small role in that. I covered one of his press conferences he held when he ran for mayor of Bloomington, and promised to oppress the masses equally. He always made me howl. Publishing a Disorientation Handbook which we gave out to Freshmen attending the college’s Orientation weekend. Our book basically told them how to live for free – where to get free food, or how to scam the cafeterias, where and how to take free showers, etc. etc. etc. Those years were amazing… Not a week went by that we didn’t do something… and it obviosuly gave Leon a lot of fodder for his later exploits! Those years were amazing… Not a week went by that we didn’t do something… and it obviously gave Leon a lot of fodder for his later exploits! What an endlessly inventive mind Leon Varjian had/has… and what a strange family of “alumni” we are who participated in his stings! Thanks for sharing, BluesProf. I was one of Leon’s merry pranksters when he ran for Mayor of Bloomington. 19% of the vote, I believe, for an open mockery of the system. Remember the campus map turned amusement park he used as a prop? I worked on that with a friend in 1976. Though, I wouldn’t say Leon was ‘swarthy’ or ‘chunky’ as when I knew him he was a vegetarian, quite skinny, and of small stature, but he was quite creative when it came to getting attention. I was an undergraduate w/Leon Varjian at Montclair State – in spite of all his “shenanigans” I knew he was a very intelligent student – he challenged us to think since Montclair State was such a conservative institution and Leon wanted to “wake us up”. I always enjoyed him, he always made me laugh and although he wouldn’t have a clue who I am, I never forgot him. I noticed on this blog that nobody mentioned he came to graduation in May 1972 wearing Mickey Mouse ears and once he was decked out as “Mother Nature” (It’s not nice to fool Mother Nature). Oddly synchronistic that Leon died on my 60th birthday! Here’s a toast to a goofy but infinitely wise man. Melba!